We've been dealing with a decent amount of snow here the past 24 hours, and, while it is warming up and quickly melting, I really just wanted to remind Mother Nature that is has been officially spring now for over a week and we don't need the 10 to 20 inch snow storms anymore. In fact, remember last week when it was 70 degrees and we took Brooklynn on a walk to a park about a mile from our house? Outside, in short sleeves? 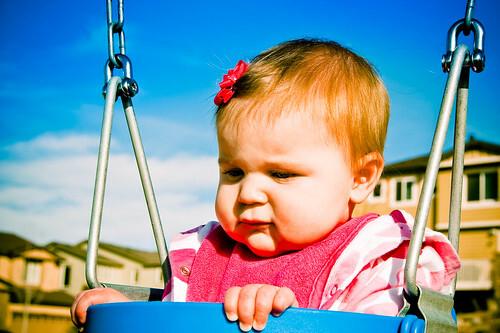 And put her in a swing for the very first time? Yeah, we'll take more of that. Thanks.